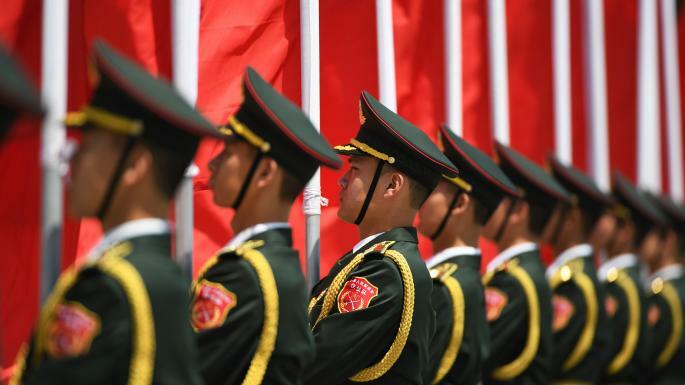 Timely Meditations: Are India and China destined for war? I have been following the Sri Lankan politics with some concern over several weeks. Democratic institutions have had some bad time lately. It does indeed seem, after Franklin, that when you wish to give up a little liberty for the sake of a little security, you get neither liberty nor security. Sri Lankans have endured long years of Civil War, which was eventually ended, rather brutally, by a strongman, but once the strongman has risen, he can't be put back in the bottle anymore. Rather, the dictatorial and the corrupt have now come together to make a mockery of Sri Lankan democratic institutions, which happen the oldest in Asia, and the country is in a constitutional crisis. If this isn't resolved, and it is hard to see how it could, the country is heading to either a Civil War or a coup, and possibly both. This is unfortunate, but all this can be seen not just as machinations of corrupt and ambitious men, but also as a part of regional power politics between China and India. India considered Sri Lanka as a part of its 'sphere of influence', because of geographical proximity and cultural familiarity, and indeed because of the close links of Tamil populations of two countries. More importantly, Sri Lanka is logistically extremely important to the Indian economy, as its seaports can receive container ships that nearby Indian ports can't (smaller vessels carry the materials from Colombo to the Indian ports). However, the same geopolitical reasons make China extremely interested in Sri Lanka: The southern Sri Lankan container terminal of Hambantota is an important part of China's OBOR initiative. This port, which has so far failed to work (as ships prefer to go to long-established Colombo), is one of the key points of contention in Sri Lankan politics, as the port, championed by the Pretender-PM, was mired with corruption, nearly bankrupted Sri Lanka and now under the control of a Chinese company. In fact, the current Sri Lankan political crisis may have more to do with this port than with anything ideological or constitutional. From the vantage point of India, this is also part of a larger development. While Indian politics remains obsessed with its internal divisions, and who should or shouldn't eat beef, and at best occasionally concerned with Pakistan, China seems to be popping up everywhere. It had tried to shape the politics of Maldives before, though, in the end, its plans somewhat faltered in the face of a democratic backlash. But it followed a plan, not unlike the one it has followed in Sri Lanka so far, and at one stage of Maldives crisis, the Chinese fleet did show up. Bangladesh's otherwise India-friendly government has been pressured and bribed by China and while it has managed to walk the tightrope quite admirably so far, it has suddenly felt the need of having its own submarines, which it bought from China, and unable to provide trained crews to man the fleet, it has hired a Chinese navy crew instead. After India's bungling interventions in Nepalese politics, it now has a China-friendly government with the intent of undoing the deep Indian influences on the country. With Pakistan and Myanmar being dependent on Chinese money and infrastructure, India seems to be completely encircled. There are reasons why this situation is rather dangerous. While a possible US-China conflict in the South China sea gets a lot of attention, an India-China conflict is far more likely. The United States and China are more economically interdependent than China and India. The former scenario will be devastating for both sides, whereas a China-India conflict can remain a limited regional conflict. While the US has overwhelming Military superiority over China, for a battle in China's backwaters, the powers are somewhat evenly matched; not so in case of a Sino-Indian conflict, which is still China's neighbourhood and China has an overwhelming advantage over India militarily and technologically. And, while China must engage with the United States peacefully to continue its economic emergence, India is an adversary China must take on if it has to get its way with its grand plan of OBOR. In fact, the financial precariousness of the OBOR projects, as in the Maldives and in Sri Lanka, makes a conflict more, and not less, likely: For the Chinese, running out of money is equivalent to running out of time. And, India is a significant adversary to defeat, as a Sino-Indian conflict can send a decisive message that the United States wouldn't necessarily intervene if a conflict breaks out in the Indian Ocean region. The Trump administration is effectively disengaging from the world, and in its current mood, it may consider a Sino-Indian conflict to be one among its two adversaries, designed to weaken both and restore its primacy in other regions, such as the Middle East, Central Asia and closer home in Latin America. The nationalists in China may consider the next couple of years as an ideal window to expand their zones of influence and take out a potentially mighty adversary and a competitor for regional influence. And, this may be in good time before China's demographic decline sets in and India's demographic dividend starts being encashed. Such scenario-making, however, depends on a zero-sum paradigm of competition, which is Western by construction. It is not necessary that the Chinese leaders would think in these lines, necessarily. This may make perfect sense in the context of national self-interest, but that's a European paradigm to boot. The large Asian countries, such as China and India, are not European nations: They are both more precariously balanced and have different views of history than their European and North American counterparts. Besides, the above scenario projects India's interests being irrevocably opposed to China's: While that may indeed be the case in Sri Lanka at the current moment, there are other areas, such as Central Asia, Middle East and Africa, where India and China could gain by working together. In fact, the current Indian government may be less predisposed to do the West's bidding than it was ever in the past. I grew up believing in a common Asian heritage and seeing India as an Asian country, above all else. In fact, I believe realising India's Asian roots may help solve many internal conflicts of India. India's culture, education and worldview were altered during the British rule in India, which left the country partitioned and forever in the throes of internal and fratricidal conflict. China is also facing significant challenges as it follows the Western models of industrialisation: Its economics and politics are facing challenges as its surplus driven economic model is driving unsustainable booms. It may indeed pursue its expansionary ambitions in its own peril: Rather, finding common grounds in Asia is needed to save its dream and there would be no common ground without India. So, on balance, a Sino-Indian conflict is likely, but it is not destiny. A particular model of world politics, the one we are used to so far, seems to point to the inevitability of conflict. But that is not the only possible model, particularly to those who can use 'Asia' as a method and draw lessons from it. That alternate paradigm should expose how foolish it would be for the Indians and the Chinese to battle each other. A different future is surely possible and one must do everything to bring that about.